Sugarlane Designs: FNSI–what can you win? Before I tell you that, I need to show you what I got up to on Friday Night! I know, I’m a tease….. Mind you, I probably should be getting on with some of the UFO’s I’ve already started, but this one was just too stinkin’ cute to not start, don’t you think? And you can never have too many needlecases. I’m planning on finishing this one during the coming week. We’ll see how that goes, shall we? It’s a Rosalie Quinlan ‘Simply Stuffies’ kit of Matroyshkas, with the printed linen panel and contrasting fabric…just so sweet! I’ll have to make sure Mr RNG is free on Monday to help me with the draw. Keep your fingers crossed…..it may just be you! I’m off to write a speech now…..it’s our official opening of the Artspace tomorrow so I best be ready. Have a wonderful Sunday…enjoy whatever you do. All the best with the Artspace opening. Those Tilda projects are just lovely. You made some great progress on yours. Thanks for organising FNSI. Ooh Wendy how pretty is that!!!! Is that needleturn????? Holy cow. I can so relate on all the projects - sometimes I get so overwhelmed by them all I have to sit down and play solitaire on the computer for a few hours. *G* Lovely prize for FNSI! A big day for you tomorrow. All the very best to you and everyone involved. I can see why that one has gone to head of the queue. What a gorgeous block, Wendy. I don't know if my only sewing one press stud while stitching along with the girls in the Northern Hemisphere counts! LOL! so cute, love your stitches. What a pretty needlecase this will be. Great Friday night sewing. Searched for group on Flickr but two others came up. Can anyone send me the link please? Always so much loveliness and busy-ness on the Lane :) Love what you've been up to. That IS a cute needlecase pattern! Someone will be lucky to win the kit. I'm sure your speech will be perfect and welcoming! Lovely block, love Annis designs. That's a lovely block, so pretty in the tilda fabrics. 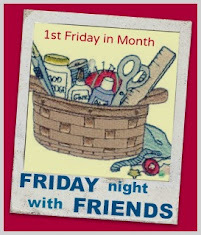 Love your stitching, Wendy and that is one cute FNSI prize.